- Non-corrosive and immune to galvanic or electrolyte erosion. - Lower maintenance cost and long lasting services. FRP Fiberglass Enclosure Reinforced Polyester is the material of choice in applications where physical strength specifications are average and excellent corrosion resistance is required. - Unlike metals, fiberglass reinforced polyester is non-corrosive. These being the world’s first ever standardized, mass-produced range of enclosures, Rittal compact enclosures AE have developed into a highly successful series. This is complemented by unbelievably fast availability with Rittal’s “Off-the-Shelf, Immediately service. Our line of Rose Fiberglass Ex Flange enclosures have fulfilled some of the most versatile demands around the world. Proven reliable, this line is a glass fiber reinforced enclosure system made of polyester resin for application in all Ex areas. 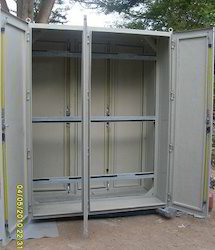 Cooper B-Line NEMA Type 4X JIC, pushbuttons, single-door, double-door and large panel enclosures are available in corrosive and UV resistant materials whcih can be utilized in indoor or outdoor applications where a degree of protection against corrosion, windblown dust and rain, splashing water, hose-directed water and damage from external ice formation is required.